Stride has announced the winner of the Save the Arcades 2 contest, awarding $25,000 to one of three gamer-nominated classic arcades. There was a time when the arcade experience was almost a mandatory part of growing up. Whether it was the clean-and-shiny place in the mall with no smoking or swearing allowed, or the half-dozen grimy machines in the back corner of the pool hall where the change guy doubled as a bouncer, those collections of noisy, flashing stand-ups, with maybe a couple of pinball machines thrown in to keep the old-timers happy, were places of absolute magic. They're pretty much gone now, supplanted by family-friendly operations with prizes for kids and, obviously, the advent of high-quality home gaming, but a few die-hards across the country are doing their best to keep the spirit alive and Stride Gum, if I can say so without sounding like a shameless shill, is doing its part to help out. The Save the Arcades 2 contest pitted three old-time arcades - Ground Kontrol Classic Arcade in Portland, Oregon, Rocky's Replay in Winter Park, Florida or Arcade Infinity in Rowland Heights, California - against one another for a $25,000 donation to help keep the machines plugged in and the quarters flowing. The rules were simple: Gamers were invited to hit savethearcades.com, check out all three locations and then play Cowbots 2010, a goofy clone of the 1982 hit Robotron 2084. Once the game was over, players could donate their points to the arcade of their choice and the one with the highest total score at the end of the contest would take home the cash. 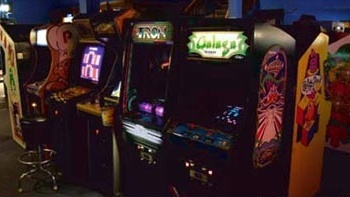 All three arcades look great but the big winner is Ground Kontrol Classic Arcade, with a score of almost 625 million points, well ahead of second-place finisher Arcade Infinity, which earned over 371 million points, and Rocky's Replay, which came in at nearly 110 million. Ground Kontrol was originally founded in 1999 and has since been purchased by five life-long arcade fans who say they'll use the money to add space to the second floor and bring in even more great games. I can't speak about Stride as a gum because I don't think I've ever actually chewed the stuff, but as someone who spent way too much of his youth pumping quarters and pounding buttons, I think Save the Arcades is absolutely fantastic. Gaming at home is great and I would never give it up, but if I someday have the opportunity to take my own kids to a place like Ground Kontrol, I'll consider myself (and them) very lucky indeed.